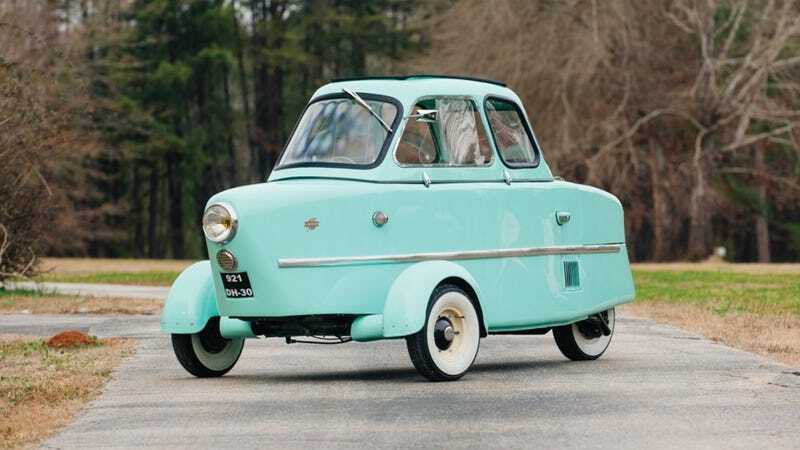 If you thought last weekend’s Autobianchi Bianchina was a microcar, just take a gander at the micro-est of micro, Inter’s 175A Berline. This 1+1 seating fold-over top car looks like the creation of my last fever dream in spectacular robin’s egg blue. It wouldn’t fare well on today’s roads, but for tut-tuttering around your private estate, or perhaps even the grounds of a racetrack on a vintage race weekend, it’d be hard to beat. Said to be one of only 30 remaining Inter 175As, this example is among the best of them. With a ludicrous handlebar steering contraption, a pointed ‘fuselage’, and a helicopter-style wind-up starter, it is even more aircraft inspired than Germany’s Messerschmitt micro car. Powered by an 8 horsepower one-cylinder 175cc engine, the Inter was hardly a speed demon, but provided basic city transport in a time where such a thing was needed. Little more than a scooter with a lid on it, this was about as bare bones as it got. In order to fit it into the tiniest of spaces, the three-wheeler’s front wheels even fold into the body, reducing overall width to just three feet. Like most any other French car, especially of this period, this is an unapologetically French car. Very French, in fact. From the single headlamp at the front to the three-speed dash-shifted transmission, this is one of the most interesting full-sized micro-machines ever built. If you’re looking to add a car to your collection that you’ll endlessly be explaining to other car enthusiasts and non-enthusiasts alike, this might be the one to get. It’ll cross the auction block at RM Sotheby’s Amelia Island sale next month. A similarly-prepared example sold last year in Paris for 78,400 Euro, so be prepared to pay a quite high per-pound price if you want it.